poey commune, Ratanakkiri province – In November, the sound of chainsaws in a nearby “spirit” forest upset a farmer in this usually tranquil Kreung hill-tribe community. The 60-year-old village elder left his work, walked up the red dust road and into the evergreen forest to investigate. But he quickly retreated when he saw the loggers were armed. Upon returning to his village, he got a headache and fever, and died within two days. When he heard about the elder’s death, a commune official asked the illegal loggers to stop. “We told them to leave the area,” said Cha Ai Sen, commune chief. This time, the loggers did. Villagers today blame the man’s death on the spirits, whom they believe punished the elder for failing to protect the trees. According to their ancestral beliefs, guardian spirits reside in the forests, and homage must be paid before trees can be cut. The incident illustrates how important the forests are to the indigenous tribes in this northeast Cambodian province. Yet increasingly, their ancestral beliefs and livelihoods are being threatened by powerful outside forces ranging from loggers and plantation operators to land speculators. Last summer, with help from a European NGO, six Kreung hill-tribe villages applied for permission to protect and manage nearly 5,000 hectares of forestland for 99 years. Provincial officials endorsed the plan, but an application for national-level recognition is still pending. If approved, the forest concession could serve as a model for legal rights for Cambodia’s more than 100,000 hill-tribe people. “This project is revolutionary in the sense that it would mean actual recognition of land use and forest management for indigenous groups in Cambodia,” a UN human rights worker said. Similar forest management plans for indigenous people have been appro­ved in the Philippines, Thai­land, Laos, Indonesia, India and other Asian countries, but Cambodia is a relative latecomer to the process. Ratanakkiri Governor Kep Chuk Tema said it’s important the highlander plan gets national support. “Because of the continuation of illegal logging, I think the only hope is that hill-tribe people are allowed to protect the forest,” he said in a recent interview. But, he said, it remains unclear whether government officials in Phnom Penh will allow the plan to go forward. “I think to cede about 5,000 hectares of forest land to indigenous people is unusual, so the government probably is taking it into careful consideration,” Kep Chuk Tema said. In December, the Ministry of Interior asked the Environment, Justice and Agriculture ministries for advice on the issue. In January, the Ministry of Agriculture indicated it would enter into a formal agreement with the Kreung village association only after the Council of Ministers acts on a community forest subdecree that would authorize such agreements. It was unclear this week, however, whether such a sub-decree will include highlanders as well as lowlanders. King Norodom Sihanouk also supports granting hill tribes legal rights. Indigenous, defined as the original people of the land, account for about 1 percent of Cambodia’s population. 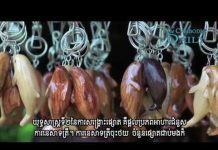 Most live in the northeast provinces of Ratanakkiri, Mondolkiri, Stung Treng and Kratie. Ratanakkiri alone is home to about 55,000 indigenous people in eight groups, accounting for more than 75 percent of the province’s total population. The area is known for its hardwood forests, its rich volcanic soil, clear rivers and, until recently, abundant wildlife. The Kreung hill tribe’s so-called Ya Poey community forest is about 25 km north of the provincial capital of Banlung along a hilly, tree-lined road. About 1,200 people live in the six-village association. Kreung believe that powerful spirits reside in their villages, their farms, their forests. Here, villages are circular in design, with simple bamboo and rattan thatched huts built around a sacred, fenced-in banana grove and communal hall. If someone breaks into the sacred grove, residents believe, the spirits will get angry and another villager—not the perpetrator—may become ill or die. The violator must organize an offering of pig, chicken, rice wine and a pig-blood mixture poured on a banana leaf. Similar spiritual ceremonies are conducted for permission to plant farms or cut trees. The forests and much-publicized slash-and-burn or “swidden” farms are central to the livelihoods of the Kreung. In the forests, the villagers fish, hunt and collect resin, firewood, rattan and bamboo. Swidden cultivation involves cutting and cultivating the area in a cyclical fashion. In this area, a plot of land may be cultivated for three years, then left fallow for five to 12 years to regenerate. When properly rotated, soil fertility and tree cover are sustained, the watershed protected. This way of life works well in areas of low population density, environmentalists say. The problem is that the land increasingly is under pressure from business interests and immigrants from the lowlands. “Available evidence suggests that village swiddens and forests have been more or less in balance for several centuries but that this situation is likely to change rapidly due to political and economic conditions,” Jefferson Fox, an environmentalist with the East-West Center in Hawaii, wrote in a December report based on a visit to the area. The highlanders have experienced various encroachments in recent decades. In the late 1960s, the government displaced many villagers and squelched uprisings in order to create a state-owned rubber plantation in the area. Twenty to 30 people reportedly were slaughtered by government soldiers at one demonstration in 1968. In the 1970s, mass American bombing caused the indigenous to flee deep into the forests under the protection of the Khmer Rouge. But until recently, the remoteness of the location, low population density and civil war elsewhere kept the tribespeople relatively isolated from modern day, free-market forces. Today, however, intense pressure on the land is coming from rubber and palm oil plantation operators, fruit farmers, logging companies, and merchants and government officials who want hobby farms. In Ratanakiri, the government has doled out overlapping agricultural and logging concessions, which only creates confusion and conflict, NGO and human rights workers say. For example, until Macro Panin, an Indonesian company, recently lost its massive forest concession in the area, a staggering 130 percent of the province’s territory outside the national park and wildlife sanctuary was spoken for through logging and agricultural concessions alone. The land was allocated by the government with no recognition of the rights of the indigenous people who have occupied the land for centuries. Anarchic in this case is a code word for military logging, which legal concessionaire also have been unable to control on their land, according to investigations by Global Witness, a London environmental watchdog. Collision with the outside world already is in evidence here. Traditionally, men have worn loin cloths, women have gone bare-breasted. But today, one is more likely to see the villagers dressed in Western clothes that they bought at the market in Banlung. Small children smoke cigarettes made from strong home-grown tobacco. Motorcycles occasionally rumble by. Gordon Paterson of a European-funded NGO called the Non-Timber Forest Products project has been working with this association for 18 months to develop a forest-management plan. “What they’re asking for is continued access to the natural resources that they’ve traditionally had access to,” he said in a recent interview. That is what the Kreung here voice. On a recent day, Commune Chief Cha Ai Sen, dressed in green pants, a blue shirt with a red-checkered krama around his neck, invited two reporters into his modest hut to talk about the forest protection plan. Sixteen people crowded inside. Women were fixing a lunch of vegetables, rice and sauce, while about a half-dozen men huddled in a circle, sipping a diluted rice wine from a large clay jar through a bamboo straw. Outside, pigs and chickens scurried about. Children fetched water in large plastic jugs. Women collected plants and tended to other domestic chores. Cha Ai Sen said he views the association as an important tool to maintaining their traditional livelihood and preserving the forest for their children. “If we do not protect it, it means the forests will be destroyed,” he said. “People are very angry” at the illegal cutting, he added. Later that afternoon, Sing Riyang, another commune member, noted that his people have lived on the fish, vegetables and fruit in the forests and farms for centuries. Under the forest-management plan, the Ya Poey Commuity Forest Association pledges to use the natural resources just for its needs. Members may cut and collect bamboo, rattan and other plants for village use, but not for commercial exploitation. Villagers use rattan for about 10 different products, including baskets, mats and string to keep their huts intact. Hunting for small animals and fish is permitted, but only with traditional gear such as crossbows and nets. Hunting endangered species such as elephants and tigers is prohibited. Elephants used to migrate to the area in August looking for bamboo shoots, but villagers haven’t seen one for a couple of years. Regulations also prohibit clearing land for gardens or farms within this particular area. The idea of a protected community forest is not new. There are dozens of such community forest management programs in the Philippines, Thailand, Vietnam, Indonesia, Laos, Malaysia, Nepal, India and other Asian countries. While forms vary greatly, the programs have similar provisions for responsible land use and often include lease rights of between 25 to 100 years. Jefferson Fox of the East-West Center wrote in a December reprt that some of the most successful programs are in India and Nepal, where forest resources already have been significantly damaged by overgrazing and cutting for charcoal and firewood. “Under these circumstances, national forest departments have fewer reservations about giving local communities rights to manage and protect their forest resources,” Fox wrote. But in areas still relatively well-forested, Fox acknowledged that national forest departments often are “loathe” to turn over land to local authorities because they also see the potential for profit. 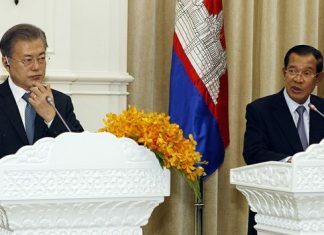 After his visit to Cambodia, Fox concluded that there is an “urgent” need to develop legal ways to protect the rights of the indigenous. On this recent day, members of the Ya Poey community forest association were in the middle of a three-day training session led by the Non-Timber Forest Products project, covering goals, responsibilities and ways to cooperate with the government. From inside the conference building, one could hear animated discussions with government officials on topics ranging from forest fires to illegal logging. When the project started, villagers were astounded at the idea that they should apply to the government for legal rights to continue to manage their forests. They were incredulous because, they noted, the government hasn’t respected its own laws. And, in about a dozen interviews, continued illegal logging came up as the biggest, current threat to their livelihoods. In December, armed loggers cut about 40 trees within the association’s community forest. But the loggers agreed to leave after the commune leader told them they were trespassing on a protected area. In another case, loggers brandished AK-47s when asked if they had permission by Kreung hill tribe members to cut trees, and promised then failed to pay villagers for logging in the area. Loa Lam Bam talked about the village elder who died after making the spirits angry. “If loggers cut trees here and our fellow villagers die, loggers have to be responsible,” she said. During the three days of meetings, tribal members and provincial officials agreed to cooperate in cracking down on the illegal activities. Association members agreed to notify provincial officials immediately when an infraction occurs, and provincial officials agreed to investigate immediately. The agreement showed the support the provincial government has for the highlanders living in these six villages. Now, tribal members await for national recognition.